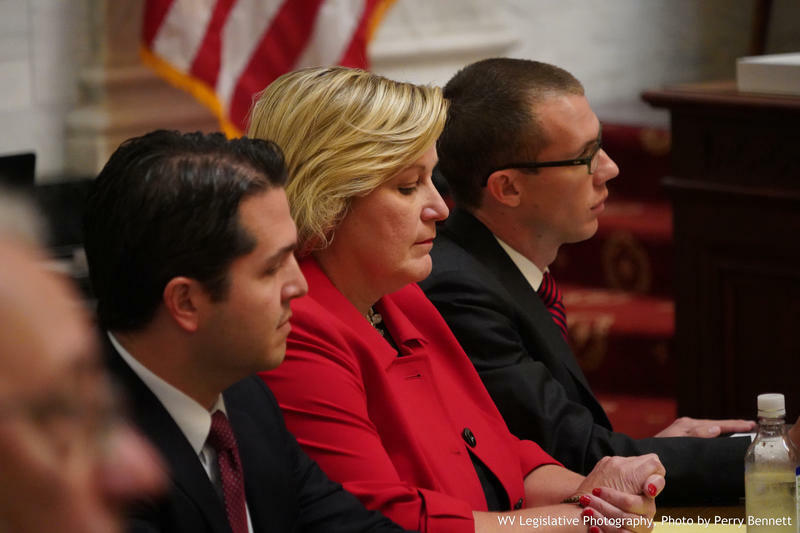 Justice Beth Walker (middle) sits with her defense attorneys Zak Richie (left) and Mike Hissam (right) on Monday, Oct. 1, 2018 on the first day of her impeachment trial. Walker was named in only one adopted article of impeachment, Article XIV, which accuses the entire bench of the state’s high court of maladministration -- collectively and individually -- for failing to hold one another accountable and failing to provide administrative oversight. In opening statements and through questioning, House Manager Del. John Shott focused on Walker, other justices and court employees receiving taxpayer-funded lunches, the renovations to her offices and the contracting of outside counsel to write a court opinion. He said, with that, she failed to provide oversight of the court system. "She came into an atmosphere of entitlement, an atmosphere of cavalier indifference -- and it’s also our position she was uniquely qualified to realize the absence of policies, the atmosphere of reckless spending, of lackadaisical approach to the protection of taxpayer assets,” Shott said in the opening statement for the House Board of Managers, a group of delegates who are acting as the prosecution. Walker’s attorney, Mike Hissam of Hissam, Forman, Donovan, & Richie, opened by stating that his client has accepted responsibility for any mistakes she has made but will defend herself accordingly to charges she did not commit. “She will own up to her conduct when she did wrong, and defend herself when, in her best judgment, she didn’t,” Hissam stated in the defense’s opening statement. While adopting articles of impeachment in August, members of the House of Delegates voted down articles of impeachment that focused on spending for renovations to her office totaling approximately $131,000 and contracting out the writing of a court opinion. During a pretrial conference in September, the House Board of Managers had agreed to publicly reprimand Walker and Chief Justice Margaret Working through a censure -- in lieu of making them stand trial and risk removal from office. Senate Majority Leader Ryan Ferns called a point of order on that effort, stating they had yet to hear the evidence. Ultimately, Senate President Mitch Carmichael ruled that the agreement to censure was out of order -- leaving Walker and Workman both standing trial. Walker took the stand as the first witness in her impeachment trial -- with questioning and testimony focused on her role in spending by the court. Evidence included photos of her court offices before and after renovations, invoices for those renovations and taxpayer-funded lunches. In cross examination from Hissam, Walker said she regrets the office renovations and that she wished she had been more hands-on in overseeing the remodel. Shott also questioned why Walker chose to reimburse the share of meals for her and her staff only after a public records request through the state’s Freedom of Information Act inquired about the meals. “When you complete a calculation of the Court's spending on meals brought in to the Capitol for the Justices and their staffs in 2017 and before that information is shared In response to a FOIA request, can you share that Information with us? Assuming it is permissible from a legal/accounting perspective, I will be writing the Court a personal check for 1/5 of the total,” Walker wrote in a December 20, 2017 email to court finance director Sue Racer-Troy. Walker pointed out that she repaid one-fifth of the cost of lunches provided to justices and other court employees in 2017 -- at a total of $2,019.24 -- and noted she is the only justice to have done so. She also noted that she never used a state vehicle or gas card -- and never requested to be reimbursed for mileage incurred in her personal vehicle for travel while on court business. "When I think of impeachment, I think of crimes. I think of stealing, lying and corruption -- and I don't think I've done any of those things," she said when Hissam asked if she feels she should be removed from office. Members of the Senate then heard testimony from Justin Robinson, manager of the post-audit division of the Legislative Auditor’s office, Racer-Troy and state auditor J.B. McCuskey. Senators, by way of rules established for the Court of Impeachment, also submitted questions to witnesses. Robinson spoke about legislative audits that helped bring the court scandal to light as well as the implementation of purchasing and travel policies, while Racer-Troy testified on the condition of Walker’s office in 2017 when the justice inherited the space from Justice Brent Benjamin. "If we were to allow state employees to buy themselves lunch, the cost to the state would be astronomical," McCuskey testified in regards to the taxpayer-funded meals. He also noted that the state Ethics Commission also has ruled on such practices. Noting that the House Board of Managers intends to call one additional witness, the Court of Impeachment adjourned until 9 a.m Tuesday. 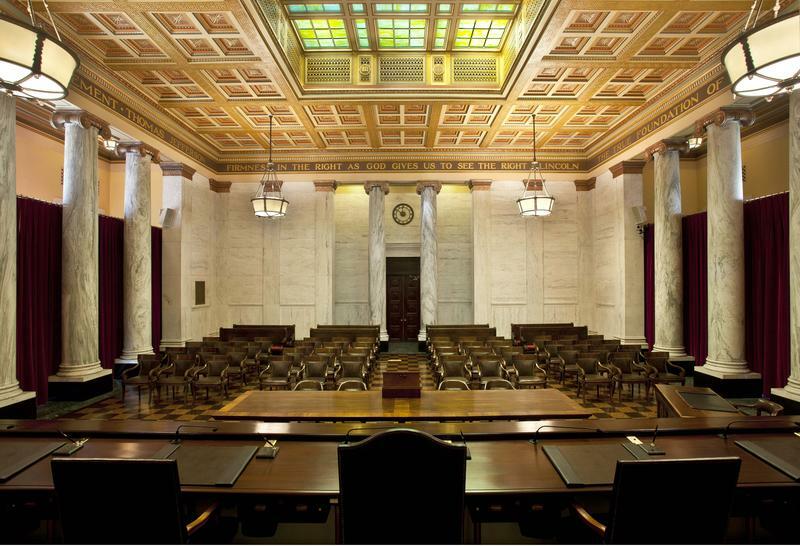 Walker’s impeachment trial is the first in West Virginia since 1875. Three other justices on the court -- including one now-retired justice and another suspended justice facing federal criminal charges -- are also set to stand trial. The state constitution calls for two-thirds of Senators -- or 23 of 34 members -- to convict a public official in the Court of Impeachment and remove that person from office. Updated: Sept. 11, 2018 at 3:55 p.m. 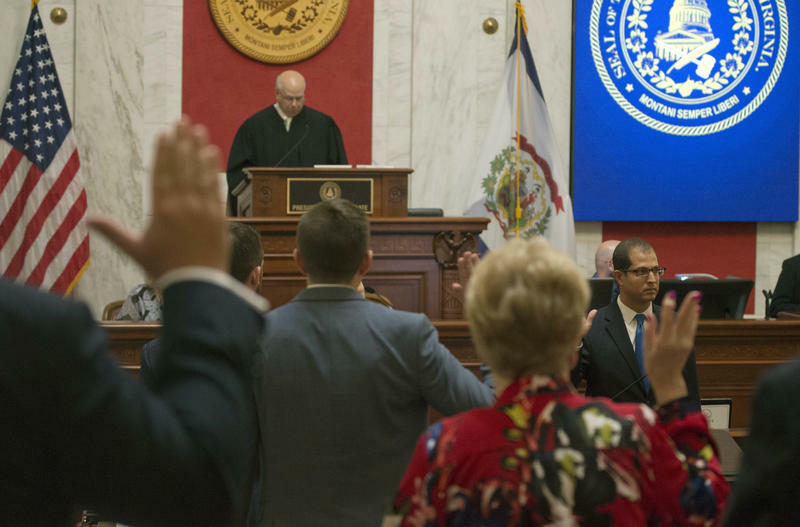 Pre-trial impeachment proceedings in the West Virginia Senate kicked off Tuesday with a roller coaster that still leaves all four impeached justices standing trial. An offer to publicly reprimand Chief Justice Margaret Workman and Justice Beth Walker was ruled out of order. Additionally, a motion to dismiss articles of impeachment against now-retired Justice Robin Davis was rejected by the Senate. 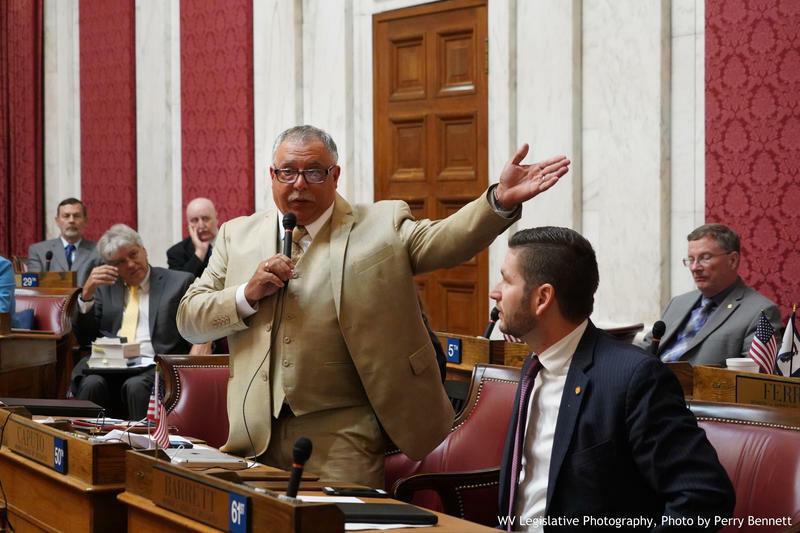 Updated: Thursday, Sept. 13, 2018 at 5:28 p.m.
West Virginia’s House Minority Whip is requesting the governor to call the legislature back into session to consider impeaching a former state Supreme Court justice who was not included in earlier proceedings. In a Thursday letter, Del. Mike Caputo asked the Gov. Jim Justice to bring lawmakers back to Charleston to consider impeaching former Justice Menis Ketchum.